"The Ballad of Narayama" is a Japanese film of great beauty and elegant artifice, telling a story of startling cruelty. What a space it opens up between its origins in the kabuki style and its subject of starvation in a mountain village! The village enforces a tradition of carrying those who have reached the age of 70 up the side of mountain and abandoning them there to die of exposure. Keisuke Kinoshita's 1958 film tells its story with deliberate artifice, using an elaborate set with a path beside a bubbling brook, matte paintings for the backgrounds, mist on dewey evenings, and lighting that drops the backgrounds to black at dramatic moments and then brings up realistic lighting again. Some of its exteriors use black foregrounds and bloody red skies; others use grays and blues. As in kabuki theater, there is a black-clad narrator to tell us what's happening. This artifice supports a story that contains great emotional charge. Kinuyo Tanaka plays Orin, a 70-year-old widow whose resignation in the face of her traditional fate is in stark contrast with the behavior of her neighbor Mata (Seiji Miyaguchi), who protests violently against his destiny. Their family attitudes are similarly opposed; while Orin's son Tatsuhei (Teiji Takahashi) loves his mother and doesn't have any desire to carry her up the mountainside, Mata's family has already cut off his food, and he wanders the village as a desperate scavenger; Orin invites him in and offers him a bowl of rice, which be gobbles hungrily. In contrast with her resignation and her son's reluctance to carry out her sentence, Orin's vile grandson Kesakichi (Danshi Ichikawa) can't wait to be done with the old woman, and begins singing a song mocking the fact that she retains, at 70, all 33 of of her original teeth. This is taken up by the villagers, who materialize as a vindictive chorus, their song implying she kept her teeth because of a deal with demons. Eager to qualify for her doom, Orin bites down hard on a stone and when they see her again her mouth reveals bloody stumps. This harsh imagery contrasts with the way the film is structured around song and dance. Although presented in the kabuki style, it isn't based on an actual kabuki play but on a novel. Kinoshita is correct, I believe, in presenting his story in this stylized way; his form allows it to become more fable than narrative, and thus more bearable. His sets and backdrops reflect he changing seasons with lush beauty: Spring, summer, the red leaves of autumn, then the wintry snows on the slopes of Narayama. On the mountaintop, blackbirds perch on snowy crags as the camera uses lateral moves to sweep across the desolate landscape. Finally depositing his mother in an empty place on the mountain, Tatsuhei greets the snow with relief: She will freeze more quickly. This he can sing only to himself, because the journey up the mountain has three strict rues: (1) you must not talk after starting up Narayama; (2) be sure no one sees you leave in the morning; (3) never look back. His adherence is in contrast with the adventures of the fearful neighbor Mata, who appears soon after bound head and foot, dragged protesting by his son ("Don't do this!"). Orin's goodness and resignation are at the center of the story. In particuar, notice her kind welcome for Tama (Yuko Mochizuki), a 40-year-old widow she has decided will be the ideal new wife for her widower son. Known for her ability to catch trout when no one else can, she leads Tama through the forest on a foggy night and reveals a secret place beneath a rock in the brook where a trout is always to be found. This secret was never revealed to her first daughter-in-law. She even wants to die before her first grandchild arrives. She wants to rid the village from a hungry mouth. Some will find Orin's behavior strange. So it is. Perhaps, in the years soon after World War Two, she is intended in praise of the Japanese ability to present acceptance in the face of the appalling. You can attach any set of parallels to Kinoshite's parable and make them work, but that seems to fit. Keisuke Kinoshita (1912-1998) is of the same generation as Akira Kurosawa. Saying that ideas sprang quickly into his mind, he moved between periods and genres, and made 42 films in the first 23 years of his career. He was immediately attracted to motion pictures; a film was shot in his home town when he was in high school and he ran away to a studio in Kyoto. His family made him return home, but later dropped its opposition to his career plans. Without a college education, he started humbly as a set photographer, and worked his way up, sending in one screenplay after another to the studio chief. He made dramas, musicals, thrillers, musicals, anything, but he never made another film like "The Ballad of Narayama." In its matter-of-fact juxtaposition of fate and art, it leaves an indelible impression. Tatsuhei's second bride Tama tells him: "When we turn 70, we'll go together up Narayama." 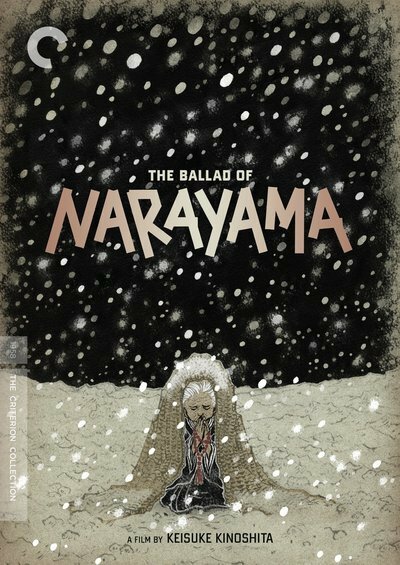 "The Ballad of Narayama" is a new DVD release in the Criterion Collection. Thanks to Wikipedia for some of the research in this article.